Towards the end of Lent you may notice purple cloths draped over the crucifixes, statues, and saint images at your parish. In some churches, these items may be removed from the sanctuary altogether. 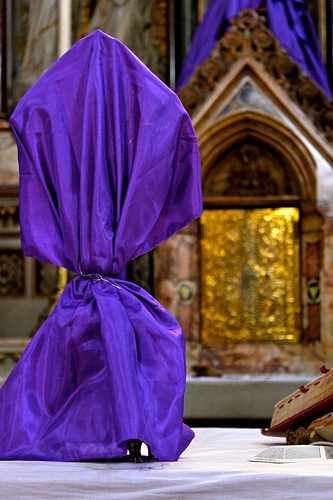 This old custom of veiling religious images is a way of focusing on the penitential aspect of this liturgical season. It reminds us in a visual way that our faith in all its glory is made possible only through the work of Christ in his suffering and death on the cross. When we cover or remove these holy and sacred images that we are so accustomed to, we are starkly confronted and reminded in a poignant way of all that Christ has won for us. The tradition is often practiced during the last two weeks before Easter, starting on Passion Sunday (now called the fifth Sunday of Lent) and ending on Good Friday. This time period is known on the old liturgical calendar as Passiontide. Even though this period is no longer officially called by this name, the tradition is still practiced in many places. Then, as in a dramatic unveiling, the holy images are again revealed for the Easter Vigil to mark the end of the penitential season. The joy of the Easter season and the hope of the Resurrection then comes to the forefront. 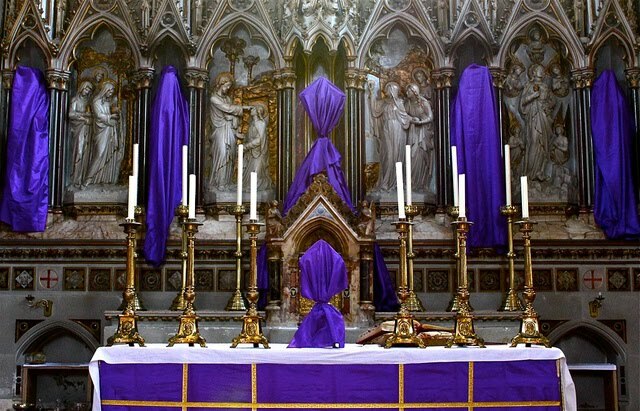 Temporarily veiling the crosses and religious images in the penitential color of Lent is a beautiful custom that helps us to reflect on the deeper theological meaning of the liturgical season. WHY: In covering the religious images during the height of Lent, all attention is centered on the Passion and death of Christ. This is why the only images NOT to be covered are the Stations of the Cross. 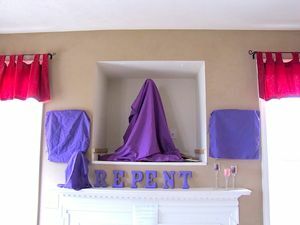 Just as the Church simplifies the sanctuary in these last weeks of Lent in order to focus on the penitential aspect of the season, we can also simplify our homes in creative ways by draping purple clothes over our crucifixes and other holy images. It reminds us that Jesus hid his glory during his Passion, so too we hide away our religious items in order to prepare ourselves to focus on and honor his Passion. This tradition can be used as a learning tool for children. As a child, during Lent I would see the crosses covered and always wonder why, too afraid to ask an adult. Explain this custom to your children and encourage your family to engage in this Lenten practice. It is easy for children to become distracted by the things we receive at Easter. But Lent is an important time of preparation for the celebration for the Resurrection of Christ that deserves just as much attention. What do we have in our home that distracts us from focusing on Lent? Do I have crosses and other images that could be covered and unveiled for Easter? This article as been updated and was originally published in April 2014. © The Catholic Company. All rights reserved. 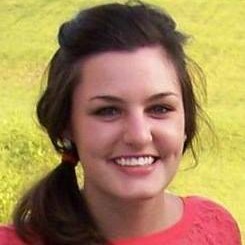 Laura Jean is a cradle Catholic who grew up in the frozen tundra of Minneapolis, MN. Searching for warmer weather she flew south and attended Belmont Abbey College. There, she cultivated a deeper love for Our Mother Mary, southern life, and a boy named Nicholas who will soon be her husband. She was instructed by her loving folks to grow her faith and when possible to share it, a mission she is now working to accomplish at The Catholic Company.